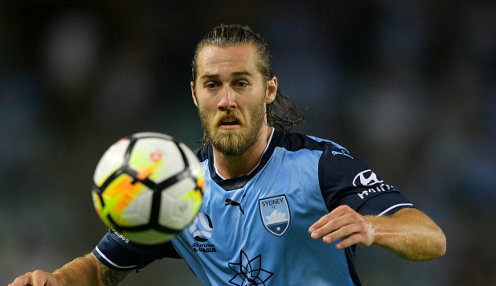 Midfielder Josh Brillante will be missing again when Sydney FC host Melbourne City on Sunday. The Australia international has been left out for the second match in a row by coach Steve Corica as he discusses a transfer to Korean club Pohang Steelers. In a way he feels like he's letting the boys down a little bit but I've assured him that's not the case. Reports indicate his representatives have been talking to Pohang, though Sydney FC club sources have said they have not received a formal offer for the 25-year-old. Brillante has won two consecutive minor premierships with the Sky Blues since joining from Fiorentina in 2016. Club captain Alex Brosque said he had spoken to his teammate while in Japan for the midweek Asian Champions League game against Kawasaki Frontale. "It's difficult on everyone and more than anyone on Joshy," he added. "He would love nothing more than to be playing and to be on the pitch with the boys he's spent the last few years playing with, so in a way he feels like he's letting the boys down a little bit but I've assured him that's not the case. "This is is football, these things happen and when a player like him is doing well you're going to attract that sort of attention. I think it's a positive for him but as a club players have to get used to these sorts of things and the boys haven't let it worry them in any way." The Korean transfer window is open until the end of this month. If he can't negotiate a deal with Pohang, Brillante is unlikely to sign a new deal with the Sky Blues having expressed his preference to pursue a move overseas as a free agent in June. He spent two years in Italy after leaving Newcastle Jets in 2014, playing 21 times for Como while on loan from Fiorentina. The Sky Blues are 19/20 to win their next game against Melbourne City, who are 3/1 with the draw 5/2. Sydney FC are 5/1 to win the game 1-0.